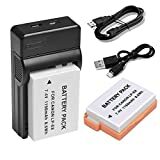 For battery:Compatibe with Canon EOS 700D,EOS 600D,EOS 550D,EOS 650D,Rebel T2i,T3i,T4i,T5i,Kiss X4, X5,X6i,X7i DSLR camera,Canon battery grip BG E8,Canon battery charger LC E8C,1150mAH. BPS USB Battery Charger charge your digital camera battery / camcorder battery directly from your USB Port, USB Phone Charger or indeed any USB port which offers charge. When you travel, as a companion to existing USB chargers you would already be carrying these days (no need for more unecessary cables). 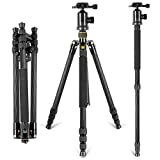 2-in-1 tripod, one of leg can be used as monopod. Quick release leg locking, giving a more convenient leg handling. Universal ball head design with 2 locks and 360° dial that photographers adjust angle free and quickly. New generation of high-density carbon fiber tube, using eight layer different angles carbon fiber staggered laminated, high temperature curing, high pressure strengthening polymeric structure. 3.For better stabilization, you can put the sandbag to the hook. Sandbag not included! 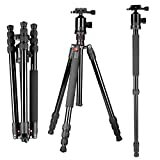 Universal ball head design with 2 locks and 360 degree dial that photographers adjust angle free and quickly.